Pictured clockwise from top left are: Hee Cheol Cho, Hanjoong Jo, Shuming Nie, and Susan Margulies. Four faculty members from the Wallace H. Coulter Department of Biomedical Engineering at Emory and Georgia Tech were recognized at this year’s Celebration of Faculty Excellence Ceremony by Emory University’s School of Medicine held on October 18. All four also are researchers in the Petit Institute for Bioengineering and Bioscience at Georgia Tech. Each year, the School of Medicine honors faculty in a variety of categories for the excellence of their work, teaching, distinguished service, mentoring, and leadership. 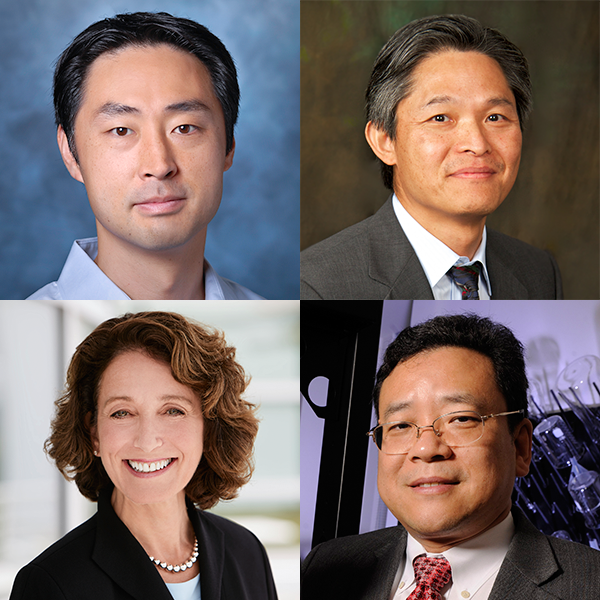 The Coulter Department awardees are Hee Cheol Cho, Hanjoong Jo, Susan Margulies, and Shuming Nie. Cho is Urowsky-Sahr Scholar in Pediatric Bioengineering and associate professor in the Coulter Department of Biomedical Engineering. Cho was recognized as a “Hidden Gem” within Emory’s School of Medicine. Faculty members nominated for the Hidden Gem Award by their departments are recognized for their outstanding, but often unnoticed or unrecognized, contributions to Emory or beyond. Jo, the John and Jan Portman Professor and professor in the Coulter Department, was recognized in the External Award category for his service as vice president of the Korean-American Scientists and Engineers Association. Margulies and Nie were recognized with the MilliPub Club award. Established in 2009, the award recognizes the achievements of Emory faculty who have published individual papers that have been cited more than 1,000 times by their peers, as compiled by Thompson Reuters Web of Science. Margulies is chair of the Coulter Department, and a Georgia Research Alliance Eminent Scholar in Injury Biomechanics. Nie, a former Wallace H. Coulter Distinguished Faculty Chair in Biomedical Engineering, recently relocated to the University of Illinois at Urbana-Champaign. He currently serves as a program faculty member in the Coulter Department.